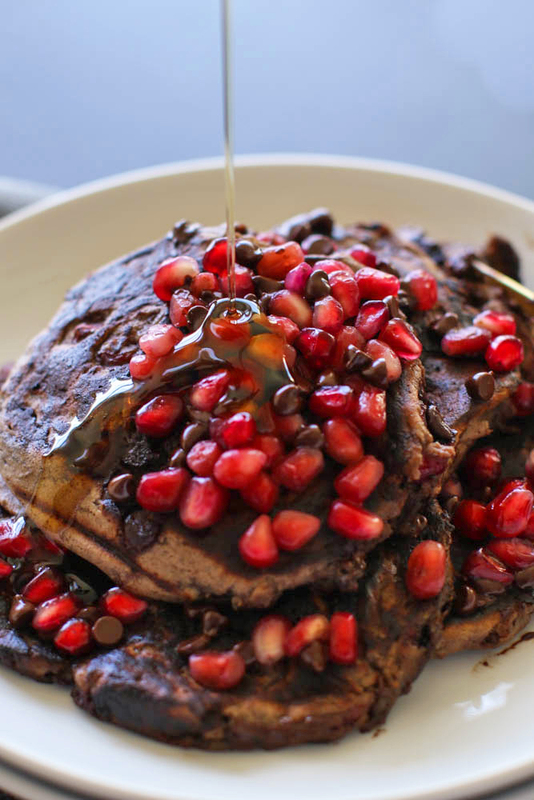 I created these Chocolate Pomegranate Protein Pancakes for those mornings you wake up craving dessert. They’re decadent and chocolate-y but packed with fruit, protein, and antioxidants! If you don’t have pomegranate and cacao powder on hand, these pancakes will still be great topped with chocolate and pomegranate seeds on top. I love to make a stack of these after a workout for the ultimate breakfast treat. Enjoy them stacked high with an iced latte this spring and summer. They’re perfect for a fun weekend breakfast idea. 1. Warm a skillet over medium heat with a little bit of nonstick spray or avocado oil. 3. Next, add banana, almond milk, protein powder, cacao powder, and pomegranate powder and blend until well combined. 4. Spoon mixture onto the skillet to form several pancakes. 5. Add chocolate chips and pomegranate seeds now, if desired, or before serving. 6. Heat for 5 minutes, or until golden brown underneath, then flip and heat for 1-3 on the other side. 7. Transfer pancakes to a plate and top with more pomegranate seeds, chocolate chips, and maple syrup, if desired. Enjoy!